Farthing is the first book in Jo Walton's Small Change trilogy set in an alternate post-WWII Britain. The United States never entered the war, and Britain came to terms with Hitler to end the war - so Hitler's campaign to cleanse the world continues in Europe, and Britain's powerful Farthing set continues to set post-war policy for the country. One morning, a prominent politician is found dead at a house party. The top suspect is a Jewish man married to Lucy, a pretty, naive young woman who just happens to be the daughter of one of Britain's political power coupons. Detective Carmichael is assigned to the case, which becomes more and more murky. Can he clear Lucy's husband of murder without exposing his own secrets? This was an utterly brilliant novel, and I was so thrilled to discuss it afterward with Kelly and Ana. Kelly unfortunately had to bow out of our discussion early, but Ana and I discussed the whole book. Below is the first half of our group discussion, and you can find the second half on Ana's blog, things mean a lot. Kelly: Jo Walton tends to be an author I collect and then don’t read. My friend that works at the bookstore here has been recommending her forever. This is only the second time I have read a book by her. The other one I read was Among Others, which I really liked, but lots of time has gone by since I picked that book up. I am glad I did because I really enjoyed it; and know I would be a great fan of Walton if I would just read her books instead of piling them on my TBR. What about you two? What was the path like that lead to you reading Farthing? Aarti: That’s so funny because my experience has been the complete opposite! I only really heard about Walton this year when everyone started posting about Among Others, but I wasn’t really so interested to read that book. I found it on display at the library and decided to get it, and then I loved it. And then I read Tooth & Claw because that sounded even more my style than Among Others, and I really enjoyed that one, too. But I know that Walton is even more known for her alternate history mystery series, so I was really excited to read Farthing as well, and it didn’t disappoint, either! Really, my entire knowledge of Walton came this year and then I read three of her books over the course of several months, which is pretty unheard of for me! Usually it takes me YEARS to read so much of an author’s backlist! Ana: I think I've read a book of hers a year since I first discovered her with Tooth & Claw. However, I don't think I'll be sticking to that rhythm, since I want to read the rest of the Small Change trilogy as soon as possible! From the brief exchanges we've had over e-mail and social media, it seems that we all loved Farthing. So I was wondering, what was your favourite thing about it? I'll go first: I love how Walton used the conventions of genre to lull readers into a false sense of security that sort of matches her characters' journeys, particularly their desperate attempts to cling to hope. I went into the book knowing it was going to be an alternate history set in a totalitarian Britain, so my brain was never really fooled - and yet my emotions sort of were. Farthing begins as a country house mystery, a genre many of us associate with comfort reading. Sure, bad things can happen in cosy country house mysteries, but usually the murder victim turns out to have been more than a bit unpleasant anyway, the murderer is caught at the end, nobody else gets hurt, and everything is set straight. Because of those comfort reading associations, we don't quite foresee how things will escalate in Farthing, and that makes the ending all the more powerful. Lucy believes things will be okay almost until the end, while Inspector Carmichael thinks that if only he solves the mystery, everything will work itself out. He doesn't realise the extent to which the system is corrupt until it's too late. Then they both have their illusions taken away from them in a way that absolutely crushed me, but that I found realistic, too. Walton's two main characters are clearly intelligent, but the fact that they don't realise the gravity of the situation didn't make me think any less of them. In fact, it reminded me of real stories from Nazi Germany, where intelligent and politically aware people denied what was happening until it was too late because it was simply too horrible to be true. In sum, because Farthing employs the tropes of the cosy mystery genre, we follow the characters' realisations and emotional journeys very closely, and I thought that was masterfully done. Kelly: I am so different. Somewhere along the way I got an e-copy of Farthing so I didn’t have a description to read unless I went online. Instead I just read it because Ana emailed me to say that was what was going on at the moment. I couldn’t remember what it was about. I actually thought it took place earlier than it does to be honest. I was surprised to find it taking place after a slightly altered WWII. I assumed it was an alternate history because Walton writes fantasy, but I think for a while there I got lulled into it being historical fiction. I do this with authors I have enjoyed in the past. I just decide one day I am going to read them and I never research what I am getting myself into. I find there are too many spoilers in book synopsis. I like to be surprised. And, I think I also had different expectations because this seemed like a cosy mystery. There was the murder, the investigation, and then you think maybe the big reveal at the end of the book. Instead there is so much else going on that things do not go in the conventional format at all. I enjoyed that Walton essentially played with fantasy, history, and mystery to give it her own unique mark. And, I like an author that can bend genres so well. I enjoyed the surprises along the way even if I wasn’t entirely surprised. Walton is a gifted author. Aarti: I am not sure what my favorite aspect of this book was. I think it is somewhat similar to Ana’s experience - I loved the way that Walton imbued a traditional cozy mystery with so much more. The way that totalitarianism seeps into the story through newspaper articles and off-handed comments - I think that was great, but probably something many authors can do. Where Walton really excelled was in showing just how normal that regime was. Often with alternate history or fantasy, there’s a character who seems to be on the outside, rebelling and trying to make the world right. That isn’t what happened here - everyone was just trying to make the best of the situation and the set-up of the world in which they lived had very real consequences for them all. I don’t have a copy of the book with me at the moment, but Walton said in her note at the very beginning that she wrote the story to shake people up and get them out of that sense of complacency of (my words, not hers) “Whew, dodged a bullet there!” I think she did this brilliantly. It’s true - we often look at the horrors of the past and feel this great sense of relief that evil was overcome and we all continued on to the happy present. But by doing that, we often ignore what is wrong with our world today, and that just because we may have avoided something unpleasant in the past, that doesn’t mean that our world is better for it today. What did you two think of this? Did it make you think differently about our own world? Ana: Aarti, that's such an excellent point. The book did make me think about political complacency and the "never again" mentally we all tend to slip into. On the one hand, I understand the impulse to think we wouldn't repeat historical horrors; yet on the other hand, that kind of thinking is dangerous: it's exactly what allows history to repeat itself. We need to be ever-watchful and to accept that the unimaginable could happen here and now; that we could be a part of it. Farthing captures that perfectly when, for example, David says he told his revolutionary friend Chaim that there was nothing to worry about: "I told him it was nonsense, that we could never have Fascism here because people were in essence too decent." The thing is, totalitarian political regimes are about much more complex factors than people being "decent" or not, and when we essentialise the problem like that and associate it with otherness (people over there in that foreign country and their lack of strong ethics), we let our guard down and leave the door open for its inception. "You think what you do can make a difference to what happens here," she said. "You think we Jews in Poland, in Germany, in Hungary, we did something wrong, something to deserve what happens to us. No. It doesn't make any difference. It wasn't our fault. It isn't something it's at all possible to control. "But in England it's different," David said. "You've been safe here for ten years. We fought against Hitler, and we'd fight again if there was any threat of him coming here." "They didn't fight him in Europe. Besides, you still don't understand that it wasn't Hitler who broke my window. It wasn't one mad German - it was the hate that everyone had inside them against the Jews. I used to think just the same as you do. I thought so until I was forty years old. You've just been lucky so far, that's all." This put me in mind of what I was saying the other week about Zadie Smith's NW. On the one hand, it's human and understandable to want to believe you have some control over your fate, and the way David and Lucy cling to that belief was actually very moving. On the other hand, the dark side of that mindset is that you also have to belief that less fortunate people just didn't do whatever it is you're doing and are therefore to blame for their misfortune, as Mrs Smollett so well illustrates. Aarti: very good illustration, Ana. It was interesting/chilling to me that all the characters seemed to think, almost blindly, that if there was to REALLY be a problem, England would go back to war and ensure liberties were safe- but they didn't seem to notice that their own civil liberties were being restricted, no matter how many newspaper articles pointed out that they lived in a totalitarian regime. It's a very good way of showing us exactly how comfortable people can get with what they deem to be the norm, rather than what they deem to be right. Ana: Something else I wanted to ask you is whether you have any thoughts on the representation of gay and lesbian characters in the novel. I have a few of my own, but I'll let you both go first! This was a very interesting post! I had no idea that this book was even out there, and now I want to read it. I have sort of been burned out on WWII fiction, but the fact that this one takes place in an alternate history really fascinates me, and all the illustrations that you give citing that this book had so much going on just underneath the surface really has me excited about jumping on this one. I will be following over to Ana's site in awhile to give the second half of this discussion some attention, but so far, you guys have got me hooked! I need to go check and see if the library has this one in audio, and if not, add it to my growing list! Excellent and captivating conversation today, ladies! 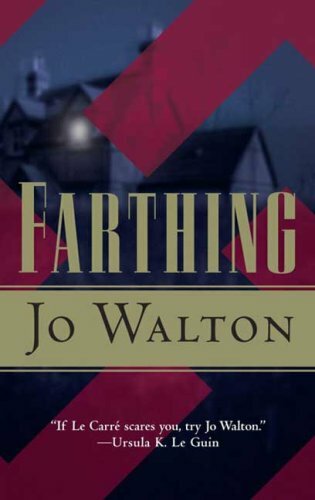 The Farthing series was my first introduction to Jo Walton and I really enjoyed it. She made it all so plausible and work-a-day, which isn't always the case for alt-histories. One of my absolute favorite books by one of my favorite authors. I have opinions about the trajectory of the series--Jo Walton linked to my (very frustrated) review of the second book on her blog, which accounted for the highest day of traffic I've ever gotten. I'll be really interested to see what you think of the rest of it; it remains very thoughtful about politics, society, and personal choices. Such good stuff! This sounds really interesting! I've only read Among Others, but I've read some of Jo Walton's writing on Patrick Rothfuss' Kingkiller Chronicle trilogy on the Tor site, too. Interesting discussion. I recently bought Among Others due to all the Walton praise, but I haven't read any of her books yet.